This is known as the Groma Kolibri, made in a country that no longer exists, the German Democratic Republic. If you look it up, you'll notice the Kolibri is often referred to as "ultra-rare" or "legendary" and other superlatives denoting considerable fame and history. I still can't make out what that's about, if it was so legendary, even I would have heard of it. Also, I very easily found one on Ebay using a simple search for "ultra portable manual typewriter" because I needed one that would fit in my backpack. Maybe I was mind-bogglingly lucky, but there it was, selling for a puke-inducing amount of money, probably because of the whole legend business. The impact on my brain, though, was utilitarian--the thing was in good working condition and it was the perfect size, though I would admit to a spurious oxytocin moment that I will attribute to pure aesthetics--it is a purrty thing. I seriously doubt that any assembly of metal could trigger a squirt of oxytocin in the human brain but mine did something very close--more like doing five sets of tennis with a wall. This machine clearly belonged to me now and the seller was just holding it for ransom, that fiend. After watching two auctions fail, followed by a couple of insulting price reductions, it was Buy It Now! or nothing. Right, so then. The Groma Kolibri was made by the Groma Büromaschinen. Founded as Maschinenfabrik G. F. Grosser in 1872, Groma Büromaschinen later became one of GDR's Publicly Owned Operation (German: Volkseigener Betrieb; abbreviated VEB) after Germany was split up in 1945. 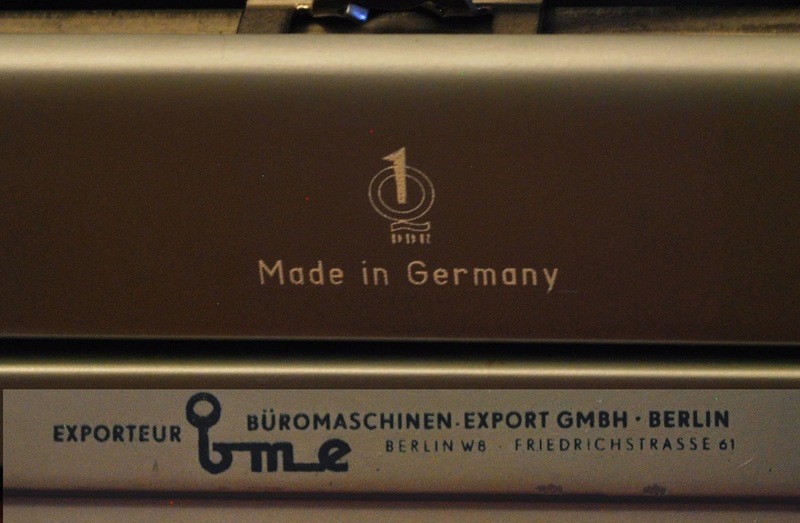 So the typewriter was made in the GDR by accident of geography—it happened to be on that side of the Berlin Wall. The story of Groma typewriters is sketchy at best; the production history you will find online are incomplete and often confusing. According to this site, the Kolibri (“Hummingbird”) was manufactured between 1954 and 1963 by Groma Office Machines VEB which produced about 150,000 machines during the period. About a ninth of this was exported abroad, including mine.In the composite picture below, note that the label at the back is in English and on the metal cover under the typewriter, it was marked for export. Some sources report that Groma halted typewriter production during the World War II when it was retooled for the manufacture of armaments. Others, on the other hand said Germany was so confident of its military advantage that production of most consumer products continued despite the war effort. If you check the Typewriter Database, serial numbers were being reported all throughout that war. Available data stops in 1953 although it is generally known that production of Groma typewriters continued well into the early 1960s. Serial numbers going up from 500,000 were probably made during these final years. Whether Groma typewriters remained in production during that war or not, it is at least clear that manufacturing went back into full swing after the war under the new firm, VEB Groma Buromaschinen, Markersdorf. There was a shortage of typewriters and people needed jobs. 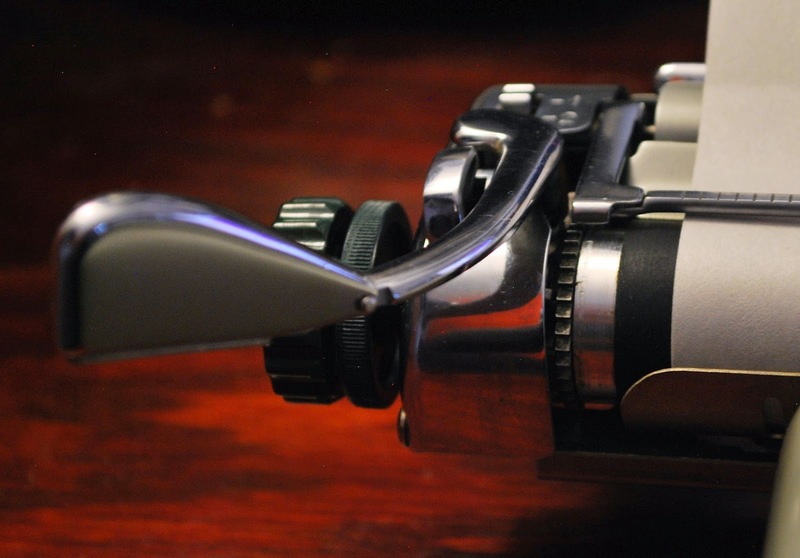 The typewriter solution worked perfectly for the war-ravaged East German economy. The tiny model, specifically, appeared in 1950-ish, labeled as the Groma Kolibri, sporting a dramatically low profile even for a portable machine. Typewriter collectors (yes, such people exist and it is surprisingly easy to become one if you don't watch out) said the Kolibri is one of the flattest typewriters ever made.It is about 31 cms by 28 cms, only slightly smaller than a laptop. And of course, one can not own a Kolibri and not take a picture of it to scale with one's mobile phone. Go ahead, google it. Mine is shown here with HTC One Mini, all of 2.6 inches wide. Even in its original leather case, it fits nicely in a backpack with room enough for a folder or even a redundant laptop. There are two other Groma models that look similar to the Kolibri--the Groma Gromina and the Groma Kolibri Luxus. The latter is a much more posh model--two-toned and with more features.The Kolibri itself was in production for only about a decade, however. In 1960, the line was supposedly discontinued, probably overtaken by the Luxus which had the look of the psychedelic 70s. It is the monochromatic signature of the Groma Kolibri, however, that makes this model look so ridiculously elegant, bearing no resemblance at all to the plastic three- or even four-toned Olympias and Olivettis of my childhood. A remarkable collector in Typewriter Talk came across a 1962 sales receipt for a Groma Kolibri Luxus indicating that at the time, you could get one for DM363.80 including tax. In today's money, this would be something between $692 and $703.68, based on the comparative average prices of goods and a historical average exchange rate of DM3.99 to the USD for that year, adjusted to iinflation. But the more relevant indicator of goods and services (GDP adjusted to inflation) puts it at around $1,450! Brand new, anyway. My Groma Kolibri was clearly well-cared for, despite the chipped paint and the nicotine stains on the left--one of its former owners smoked with their left hand, maybe? But that was easily removed, so was the accumulated dust, various strands of hair (blonde) and assorted stains from years of use. It was in so good a condition, in fact, that had I known of its supposed legendary-ness, I would have taken before-and-after photographs and the difference would have been only barely visible. There was also nothing functionally wrong with it that could not be fixed or adjusted without professional help. Except for the rubber feet and platen as well as the keys which are plastic, the machine is made entirely of metal. 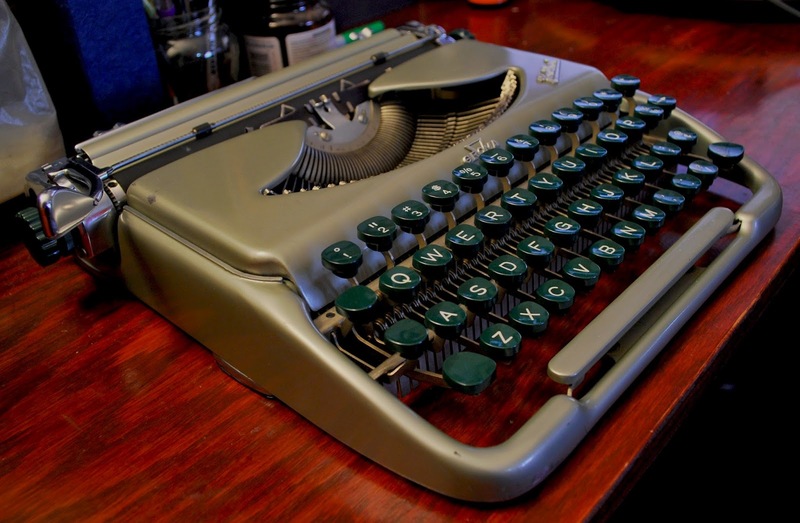 As a result, it is actually heavier than my other, much older typewriter, a stripped-down Depression Era Royal Portable which is significantly bulkier. The machine, it would seem, is nowhere near its retirement age despite being over half a century old. It would probably have been better off had it been bought by a conscientious collector who would obsess over it for eternity. With me--on my desk, in my backpack, under some tree, in various cafes--it would have a ton of work to do yet. If you found this post and have more information to share about the Kolibri (or perhaps corrections to mine), raise an appendage. The Classic Typewriter Page by Richard Polt I do not know if this site is current, but there is a rocking collection of Groma typewriters here. Beautiful. I have one of the Luxus ones, and one like yours. I'd rather have them go to writers than collectors. Enjoy and thank you for the well-researched post. Thank you. I have to tell you, the sound of it ricochets all over if you use it in the woods. This mother is loud! If you find any more information about these gems, get back to me, yes?